I read Augusten Burroughs’ Running With Scissors years ago, and it made quite an impression on me. It was shocking and funny--and left me feeling terribly sad. I meant to go on and read more by Burroughs’, but I never managed to because my interest in memoirs has waned over the years. 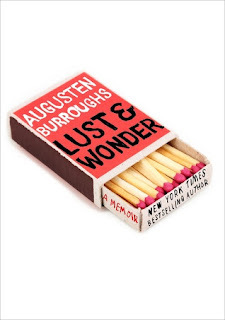 When Lust & Wonder appeared in my mailbox, the latest from my Going Postal book club, I was 1) sad because it really doesn't fit with my happy Christmas-themed bookish mood and 2) happy because I would finally be able to visit with Augusten Burroughs again. Augusten Burroughs is the child of an alcoholic professor and a psychotic poetess who, in his later childhood, is sent to live with his mother's psychiatrist. Neglected and abused, raised with very little structure and guidance, and struggling with his own mental health issues early on in life--all of which have a profound impact on his adult life, including how he copes, sees the world around him, and in his relationships with others. Lust and Wonder does not go much into his childhood other than a mention here and there to give the new reader an idea of where he comes from. You will find that in the author's earlier books--although this one does stand well on its own. In Lust and Wonder Burroughs opens up about his life after his memoir Dry, particularly his search for love and stability. He talks about his relationships—the failed and the successful. Burroughs seems to have a difficult time trusting his own gut when it comes to his romantic relationships, a symptom of his past and his doubts about his own mental health. There were several times throughout the book I wanted to tell him to not sell himself short. I really like Burroughs’ conversational style. I find him relatable and insightful. He comes across as a very genuine person, which is a must in a memoir. He’s very open about his experiences as a gay man, including talking about HIV and AIDS, his grief at losing a loved one, his struggles with mental illness and the mistakes he has made over the years. He lays it all out there, warts and all. He talks honestly about his dependence and struggle with alcohol, both while lost at the bottom of a bottle of Scotch and while sober. He also writes about his anxiety, a topic I can relate all too well with. I can understand his willingness to stay in a relationship that isn’t working for the sake of security and stability and not wanting to risk the unknown by making a change--especially given his past. Sometimes it is easier to ignore and suppress what isn’t working than to confront it. But at what cost? Augusten Burroughs takes the readers on his journey with him, through the pitfalls of his relationships as well as the successes. He made me laugh and cry; and I came away feeling as if I had just caught up with an old friend. To learn more about Augusten Burroughs and his work, please visit the author on the author's website. i used to be big on memoirs. I have read his other ones. I went and checked and my library has it so I will read this one also. Hillary - I hope you enjoy it. I've heard others say this one isn't quite as good as some of his other books, but still worth reading. I didn't love Running with Scissors so I've skipped his other work. My parents, however, loved it, so maybe this would be a good fit for my mom. Kathy - I can see how Running With Scissors might turn off some readers. It was quite shocking at times and the author doesn't hold anything back. I don't think I have ever read him. Which seems wrong, somehow. I read Running With Scissors years ago. I don't think I really liked the book but I still couldn't put it down. I am kind of on the fence about reading more of his book but I am glad you enjoyed this one. Carole - Burroughs has a way of hooking the reader and taking them along for the ride. I tend not not seek out memoirs but wouldn't mind giving this one a go! Iliana - I so rarely read memoirs these days. I don't think I would have picked this up had it not been for my book club. Ellen - I am glad you've enjoyed his other books! I tend to be picky as far as memoirs go and I'm glad you enjoyed this one. Will keep this book in mind. Melody - Burroughs has a way with drawing the reader in. I don't think he's for everyone, but I have enjoyed both the books I've read by him. I can't say I'm going to go out and read his other books right away. If they came my way I might read them though. Lainy - I hope you like his books if you give them a try! Memoirs are always hit and miss, but Burrows seems to have the knack! Jenclair - He really does seem to have a knack. I agree about memoirs being hit and miss. I think that's part of why I don't read too many of them anymore. Sounds like a sorrowful eye opener. I rarely read Memoirs but this one sounds like it can't be missed. Sarah - I enjoyed it. I love Burroughs' writing. Like you, I read Running with Scissors and liked his writing style. He and his brother had an insane childhood. Steph - Insane is right. I like how Augusten Burroughs can look back on it and find humor in it all as terrible as it was at times. Eustacia - No, definitely not Christmasy! I've heard of Running with Scissors but other than the title I know very little about it. Your comments about his writing style definitely make me want to give this book as well as Running with Scissors a try. They sound honest and heartbreaking and fascinating. I may wait till after Christmas though! Katherine - That's a good way to describe them. Burroughs' comes across as very genuine. I hope you like his work if you give it a try.